The latest release from Inmost Records finds label boss Following Light back in the spotlight with a brand new single. 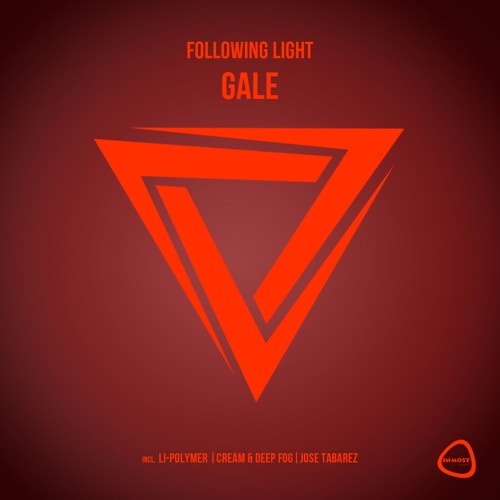 The Russian artist has been one of 2016’s most prolific producers and now presents one of his best productions of the year in ‘Gale’ backed by remixes from Li-Polymer, Cream & Deep Fog and Jose Tabarez. The release gets under way with the original mix and we find Following Light going dark and proggy. Tough beats and strong rhythmic structure makes for a great intro before a wonky lead steals the air, along with trippy vocal gates and trails of frayed effects. There’s a touch of contemporary mixed in with Following Light’s old school vibe, it’s all in those offset melodies which quickly get accented with strong rhythmic themes. It makes for a huge first act setting up a welcome break where the madness continues as the hypnotic elements deliver a minute plus of high tension before the kick finally drops for a great moment. Huge original from Following Light and one for the old school fans will certainly appreciate. Inmost Records has done a lot of projects and this might be one of their most star studded remix casts yet. First up, the incredibly hot Li-Polymer takes the track into deeper and dreamier territory. Everything gets totally overhauled for a more minimalistic and modern vibe. The big lead elements are cleverly remoulded into softer, rhythmic designs and spaced out effects. Rough stabs lead the track into a short but incredibly captivating break before a more emotive third act ensues. This one’s got detail, emotion and a lovely vibe overall. Definitely a favourite on the release for me. Next up Cream & Deep Fog bring their magical touch to the track with a version that sits somewhere nicely between the original and Li-Polymer’s in terms of intensity. The buzzing bass swells immediately stand out and with a spacious yet detailed framework the melodic elements really get a chance to breath. The Polish duo are excellent at crafting those poignant goose bump moments and they’ve certainly done that here with a third act of wondrous chord changes and waves of white noise which are highly emotive to say the least. It’s 10 minute running blows by quick which is always a good sign you’ve made something great. Wonderful remix from Cream & Deep For and another favourite for me on the release. Closing the release out is Jose Tabarez who is making second appearance on the label. A quiet beginning to the year makes this a welcome remix for the talented UK based artist and he certainly doesn’t disappoint taking ‘Gale’ into deeper, groovier territory. Anchored by a funky foundation this is likely the most dance floor ready mix on the release. Jose does a great job incorporating trippy narratives and although fairly indistinct, very unique vocal hooks. The main break takes the emotion up several notches with alien like electronics and a smooth tonal theme. It’s one of those cases where everything just sounds fabulous together and it’s definitely one of Jose’s best ever remixes. A perfect way to round out one of Inmost Records all time best offerings. Don’t miss it.